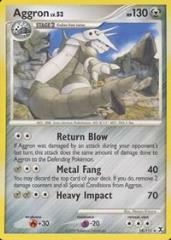 Attack 1:  Return Blow - If Aggron was damaged by an attack during your opponent's last turn, this attack does the same amount of damage done to Aggron to the Defending Pokemon. Attack 2: [2M] Metal Fang (40) You may discard the top card of your deck. If you do, remove 2 damage counters and all Special Conditions from Aggron.